Remember a few months ago when we made a Chocolate Bourbon? Well, it was fabulous! But some people tell me that they don’t like bourbon. And since one of them is my mother, and she happens to be a chocolate lover, I decided to test out a Chocolate Brandy. The recipe we made was nearly identical to the Chocolate Bourbon. Infuse for 4-5 weeks. Strain through cheesecloth or jelly bag, and coffee filters. We did not add any simple syrup. I think it would be delicious with it, but we wanted to be able to use this in cocktails, and thought it would be more versatile this way. If you have trouble locating Cocoa Nibs, please reference the post on Chocolate Bourbon. Bourbon v. Brandy… what’s your pick? I have written before that I have a much improved appreciation for bourbon now that I infuse with it. There had long been a few bourbon cocktails that I really enjoyed, but it was never at the top of my list. But when infusing, bourbon is often my favorite spirit to use. It brings so much flavor and nuance to the end result. We did a Prune liqueur show down a few months ago where we taste tested Prune Brandy v. Prune Bourbon, and although they were both delicious, the bourbon was the clear winner. In the case of Chocolate Brandy v. Chocolate Bourbon… I declare the winner to be… Brandy! I’m sorry bourbon lovers. Both of these are really amazing, and I would encourage ALL of you to start infusing with Cocoa Nibs. As much as I really enjoyed the Chocolate Bourbon, the Chocolate flavor shines through better in the brandy. But, that is just my humble opinion… have any of you infused with Cocoa Nibs? How about a Chocolate Vodka? I think it would be delicious! Categories: Infusion, Liqueur, Recipes | Tags: brandy, chocolate, cocoa nibs, infusion, Liqueur | Permalink. Ooohhhh …. Pretty! I bet it tastes as pretty as it looks! It does… and thank you! Do you use sweetened or unsweetened cocoa nibs? Hi Paul, they are unsweetened. If you feel the end result should be sweeter, you can add sugar or simple syrup when you are finished infusing. I did the same a year or two ago with George Dickel #8. it turned out really great. smoother than bourbon, but the nibs made it slightly bitter, which for me was ok. Interesting! How long did you infuse? I didn’t think the nibs made ours very bitter, but definitely not sweet either. How about the coffee Bourbon vs Brandy then? I think I’m going to try your coffee Bourbon recipe and your comments here are interesting- that you can really taste the nuances of the Bourbon in the infusion. I was going to go with Jim Beam, but am wondering if it might be better to use a more expensive whiskey. What do you think? The gin should be ready in a week. I’ve also started the mango liqueur, with some awesome mango. Can’t wait to try them. I’d like to try this with Vodka but where do you get cocoa nibs? I’ve never heard of them. Hi Maralee, check the link to the post on the chocolate bourbon. There are some ideas for getting cocoa nibs. I got mine in Portland at Cacao, but The Meadow also carries them and sells online. I think that the chocolate and banana together might make a good drink. Or really, I suppose the chocolate with just about anything would be good, coffee, strawberry, raspberry, and the list goes on. Do you mix these (I mean mix flavors together) in cocktails? I’m super interested in making this one now. I’m pretty sure I’ve seen cocoa nibs at the health food store. I agree, and have been thinking of a lot of different combinations as well… Just haven’t infused them together yet. Yes, we often combine flavors in cocktails… And the chocolate banana combo sounds like I might need to try that soon… I think you may have the infusing bug… Keep it going! Cheers! What kind of brandy do you recommend? I’ve never really bought brandy, but think it would be nice to try one! Hi Laura, thank you for reading and for your message! It seems many people are unfamiliar with purchasing brandy. It works so well for infusions! It has much more flavor and sweetness than vodka. When infusing (whether with brandy, or other spirits), I usually recommend getting a mid-level alcohol. For brandy, I think Korbel works great, but you can certainly use anything in your price range. I think that is part of the beauty of infusing. The ingredients you are adding to the liquor will really impart such great flavor that the brand is less important. If you go to a good liquor store, often the people working there can direct you to a good brand. Don’t feel like you need to spend a lot of money on the alcohol you infuse with. The good stuff can be kept for drinking on its own, or other cocktails. I hope that helps! Let me know if you have more questions. If you are looking for a chocolate liqueur, add some simple syrup after you are done infusing the cocoa nibs. This is delicious! Thanks so much for your advice, Alicia! I’m excited to try it. I’m making a few small samples for my Dad and Uncles for Christmas – they’re going to love this! I’m trying to come up with a pretty list drink list for the liquors of yours I’m trying (it’s a wedding gift). Pingback: Cacao Nib Brandy, and a Chocolate Love Potion | drink tea, dream loftily, repeat. Where do you get all of the beautiful bottles for your infusions? The bottle in this post is actually repurposed/recycled from an bottle of dessert wine. But usually I get my bottles from a couple of different places. My local home brew store has lots of great bottles. If you have any of those around, I highly recommend checking them out. (my local is Homebrew Exchange in Portland, OR.) another great place to find bottles is Specialty Bottle, which is an online bottle source. The Container Store also has some great options. (Locally I also really like a store called Mirador, which has a lot of canning supplies and bottles, etc.) I always have my eye out for fun, cool bottles… Good luck! It looks like I’m a little late to,this party. I just finished making the chocolate liqueur recipe off Serious Eats. Now I’m left with vodka infused nibs that taste awesome all by their lonesome. Any ideas how to make good use of them? I wonder if they have enough juice, so to speak, for another round of infusing. It looks like I’m a little late to this party. I just finished making the chocolate liqueur recipe off Serious Eats. Now I’m left with vodka infused nibs that taste awesome all by their lonesome. Any ideas how to make good use of them? I wonder if they have enough juice, so to speak, for another round of infusing. I was thinking of making an infused marshmallow vodka. Chocolate brandy could mix well with it. I saw a recipe for the marshmallow one on another site. They used store bought, i was thinking of making my own marshmallows. Do you think it would work? 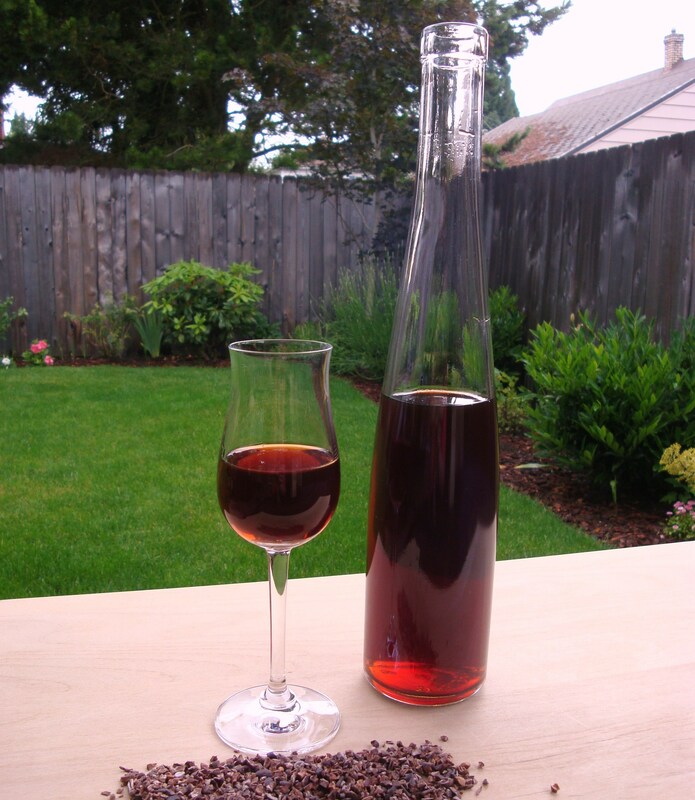 I made you cocoa nib brandy to give as Christmas gifts. I’ve strained it &’poured it thru cheese cloths multiple times & I still can’t get it to be filtered & clear like yours looks. Any suggestions? Have you tried filtering it through coffee filters? Try doubling the coffee filter if needed. Good luck!